Update (August 21, 2017): It seems BlockchainForProfit.com is down. You may or may not have heard about BlockChainForProfit.com, a HYIP site that has been the topic of most online forums in the crypto market. The website has attracted criticism, condemnation and praise in varying degrees not least due to the sensational nature of its claims and the payments, or lack thereof. Ironically, there is little to no promo material and/or reviews on BlockChainForProfit.com in the mainstream Internet. Most of the discussions are limited to Facebook groups and YouTube comments. Not to worry though. To set the record straight, and save you the hassle of trying to figure it out for yourself, we had to do a full review on this. For clarifications and suggestions, our channels remain open. BlockChainForProfit.com is quite simply a website that claims to be able to double your Bitcoin deposits. Yes, you read that right. All you simply need to do is make your deposit, click on the Double My Bitcoin tab and in a few minutes, you will receive twice the amount you deposited. No hassle, no stress, no risks. The website doesn’t have much content, just one page, which contains all the things the owners want us to know. Nonetheless, the available content is laughable and very unimaginative to say the least. This has to be the most stupid scam we have ever come across. For one, do they expect anyone with half a brain to believe that you can double your Bitcoin in a matter of minutes? What more, the site offers a bonus program called the Weekly Offer in which investors allegedly receive 0.3 BTC for an investment of 0.1 BTC in less than 5 minutes. Sigh. Do we really need to tell you that this is a scam? Anyway, we have never been ones to spread rumors and hearsay so we still have to substantiate our claims, even if they are obvious facts. To remove all doubt, we took BlockChainForProfit.com through our very own scam test and tried to collect the scanty information we could find to answer every question. Does the website promise unbelievably high yields? Yes! Yes! Yes! 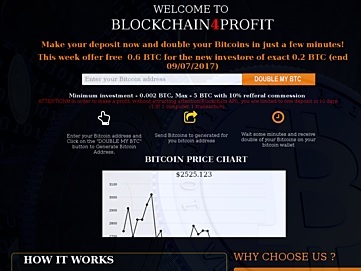 BlockChainForProfit.com promises arguably the highest returns we have ever seen – 100% profits in a few minutes in normal mode and 300% ROI in the Weekly Offer. Unlike other scams which at least make an effort to hide their true intentions and consequently attract more people, BlockChain4Profit doesn’t even make an effort. The creators of this website apparently want us to believe that you can double your BTC in 5 minutes without any risks whatsoever. Heck, my 5 year old brother would come up with a better lie. Does the site have links with other legit websites? Obviously, there are a number of legit sites, such as Alexa.com, that link to BlockChainForProfit.com but that does not mean they endorse the site or its dealings. Basically, we did find several sites linking to BlockChainForProfit.com but they were all either spam sites which contain scanty, useless information and lots of ads or paid review websites. We didn’t come across one credible site recommending this website, which is not that reassuring. We normally check websites rankings on Alexa.com to know how popular they are, and the countries where most of their traffic comes from. This helps us to determine if the site is popular enough to have our trust. In the case of BlockChainForProfit.com, the global Alexa rank at the time of posting this review was 12,307,518. Before it was closed down, most of its visitors were from Netherlands and India. The site was heavily promoted on YouTube. From experience, websites with an Alexa rank of 200,000 or less are more credible and therefore more popular. Sites ranked 200,000 or higher? Pretty good but still not 100% trustworthy. Sites not ranked? Don’t even go there. Is the website about making money from sale of Bitcoins or cloud mining? Forget all that, BlockChain4Profit is more like a Bitcoin multiplier – you deposit your coins and have them back two times over in less than 5 minutes. Supposedly. Does the website’s About Us page show the real people running the company? First off, there’s no About Us section on BlockChainForProfit.com. As said earlier, the BlockChain4Profit site has only one page which contains everything there is to the program. Note that we said ‘the program’ and not the concept or the owners. Matter of fact, the people behind the website have kept their names, addresses and details private using WHO.IS service. We managed to extract the site’s IP, however, but it happened to belong to the website hosting company, Namecheap.Inc. Simply put, if BlockChainForProfit.com scams you, it is next to impossible to track them and recover your money, unless of course you work for the CIA. Is the website duly registered in any country? No. It is not clear in which country the BlockChainForProfit.com website is located. Some analysis sites say it is located in the US while the server’s IP is itself located in Panama. Worse still, the website does not give a phone number or physical address for contact, which makes it very hard to track them in case anything goes wrong. Most importantly, we always advise that you invest only in sites that are registered in a relevant jurisdiction, not some highway-sized Atlantic island. Conclusion: BlockChainForProfit.com is a scam! With everything we have written about this website, more so on the Scam Test section, there is no doubt whatsoever that it is a very big scam. The site is built on lies and deception that are so ridiculous that even a hermit with no experience with Internet cons will see through the facade. Fortunately, the site has not yet been able to con many people and we hope that this review opens the eyes of more and more people to the reality of this fraudulent website. Verdit: BlockChain4Profit is a SCAM! If you have been scammed by BlockChain4Profit, please let us know by commenting below.